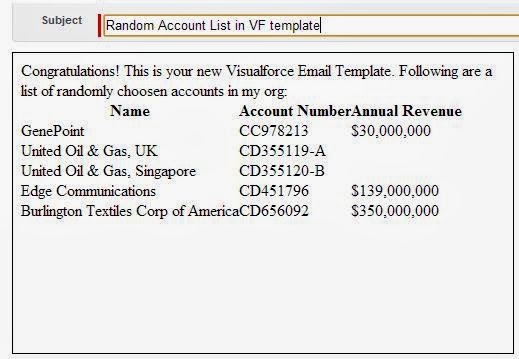 To be able to do some calculation or query some records to show on a visualforce email template we would certainly need a controller associated with VF email template. But a visualforce email template attribute [<messaging:emailTemplate>] does not allow direct association of controller with it. A workaround for this is, embedding a visualforce component that can use controller with it. We can then use this component in the visualforce email template. Lets say, we want to display some randomly chosen accounts in the email template.This is not possible unless we query in the database to retrieve the records, hence we would use visualforce component to do the task. 1. Make sure you specify the access as global for your compoennt, otherwise your email template would not compile and give below error, <messaging:emailTemplate> can only contain components with an access level of global. <c:accountlist> is not valid. 2. Visualforce email template cannot contain pageblock and its child attributes(pageblocktable for example), also form cannot be included in vf email template, hence you cannot put this in the visualforce compoennt to be used in vf email template, for vf component would be a part of email template itself. can we add more than one custom controllers in the visualforce email template?